Biography: The trio was formed in the mid-1930s by three sisters, of hungarian-dutch descent: Alexandra (1910-1987), Judith (1913-2007), and Kitty Leschan (1919-1965), whose names were italianized into Alessandra, Giuditta and Caterina Lescano. They were extremely popular in Italy in the early 1940s, but due to their mothers jewish origins it all ended in 1943. They lost their italian citizenship, they were arrested and even imprisoned. The accusation was that their songs contained encoded messages for the enemy. After the war, two of the three sisters moved to South America, where their artistic career continued. Recording info: Like in Germany and Japan, english language was forbidden in Italy, during World War II. 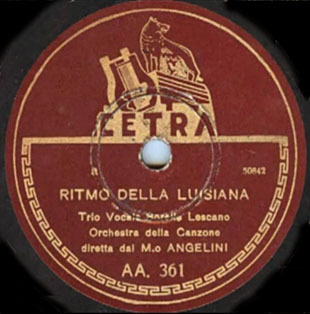 When first released, the title of the song was Ritmo della Luisiana (composers: Handy - Gagis).